Was at the gym yesterday and was doing my warm-up stretching prior to getting onto the treadmill when this chap trotted into the gym. After the usual cordial greets to the instructors, he proceeded to the inclined bench where he did a couple of stretches. I didn't pay much attention to him but it was a while before I realised he was sitting there motionless. Then it dawned on me. 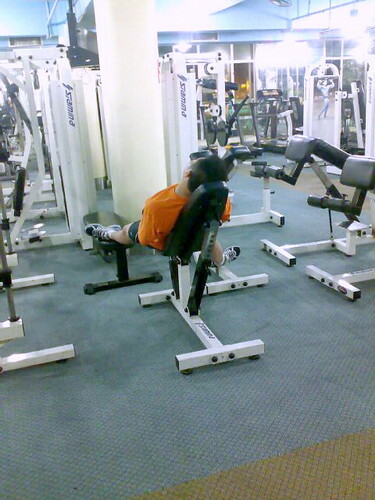 Who the f*ck comes to the gym to sleep one? Want to sleep go home and sleep lor. Come gym for f*ck??!! Walau, I cannot take it as I walked back to my locker to get my handphone. This is soooo going onto the internet. Dumbass! It wasn't until 20 minutes later, when I was already pounding the treadmill, before he stepped up alongside to the treadmill beside me. anyway, it is so bloody hot nowadays that i wont mind sleeping in any place with aircon... sighz..
Chocolate Gal: Our gym right now still no aircon coz not summer months yet. go figure. My gym.....people reading newspapers. And ladies, cycling so so so slow and yabbing away. So there you go, some people, gym....sleep area, reading area and get away from whoever that's irritating you at home area! Akk: What exertion? He just came in! Faith: You mean that were just sitting there reading papers? I mean I read a book with I am on the cycle though. I mean...read papers with the papers on the bench and they stand around and read. Ladies on the cycle...cycle so so so so so slow with a book. And some, talk and chat so loudly. It does get a little amusing at times though. Oh...and the bathrooms....some people actually go to the clubhouse's bathroom just to take showers every single day. And some employers, make their maids shower there....see the madness? Starmist: He came in straight away plonked himself down on the bench. No warm up to speak of! hurhur. maybe it's the... walk to the gym which did him in. somehow he looks a bit like.. kennysia... from the pic. ahem. Starmist: Probably the stairs since it's on the second floor. I think Kenny a bit more chubby than this guy.